The answer is this: Yes, it’s normal. Yes, you should use it. And yes, it’s where a lot of the broth “magic” is hidden. (Also, vegetable broth does not have this, which is – in my opinion – 99% why it lacks flavor. Fat = flavor, mmmmmkay?) The only caveat to this is if you are not using super high-quality meat and bones because then the (new-ish) fear is that your broth could be hurting you more than helping. It (gelatin) is usually encountered in powdered form, but gelatin also describes the collagen extracted into broth. Properly prepared broth will gel, just like Jell-O, when cooled, because collagen is rubbery and flexible. Webster’s Dictionary defines gelatin as “the…substance extracted by boiling bones, hoofs, and animal tissues.”16 Since collagen is present in both bone and cartilage, it can be extracted from either of the two connective tissues and be labeled as gelatin. ….one general area of health prescription clearly comes to the fore, and that is digestion. Most notably, he refers to over 30 years of research on gelatin’s ability to improve the digestion of milk. In the early 1900s gelatin was therefore recommended as an ingredient in infant formula, to decrease allergic reactions, colic and respiratory ailments. Gelatin was also reported to increase the digestibility of beans and meat (which gives credence to the practice of serving meat with gravy). It was also found that gelatin increased the utilization of the protein in wheat, oats and barley, all gluten containing grains. Quite honestly, there is nothing else profound I can add for why I believe in gelatin for gut healing. All of those reasons, in summation, are why I believe in it. Many of them are reasons you all would believe in it, too….as you live with one or several of the conditions listed above. When I was super rigid with gelatin supplementation daily, I was at my best. I have returned to it, most days of the week. 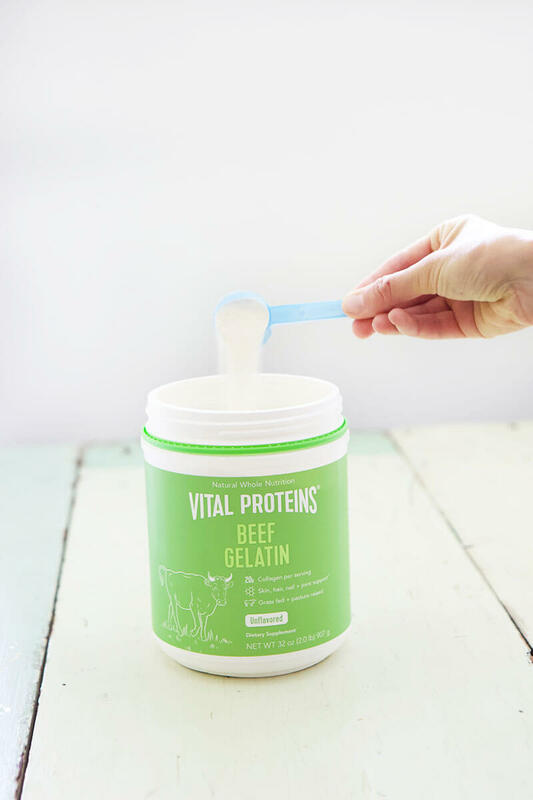 With various gelatin brands on the market, why would you choose Vital Proteins? I trust them. I have been in contact with Vital Proteins for a couple years now. My main contact is always responsive, helpful, and truly interested in wanting to help me communicate their product and brand in the best way possible. The only thing I have yet to do with the brand is physically go there (on my list!) to meet them. And when I trust a brand, I’m always likely to choose it no matter what and recommend it to friends and family. 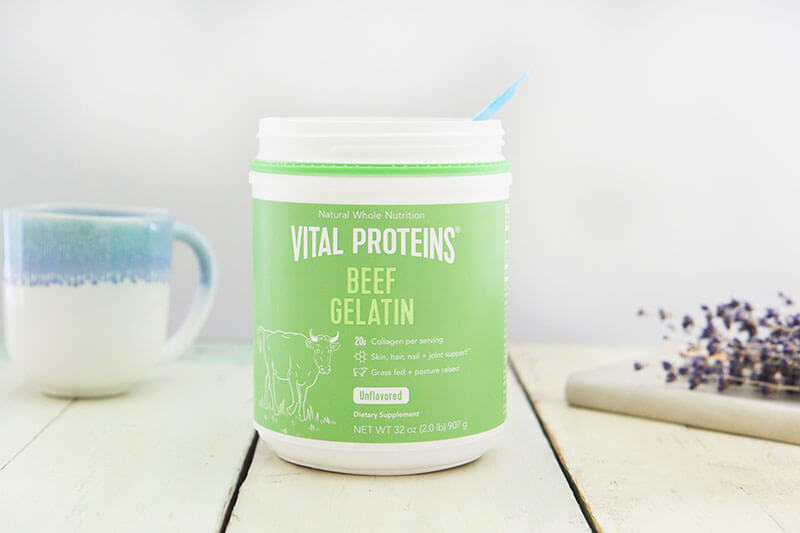 You can learn more about Vital Proteins Beef Gelatin and buy it HERE. I’m looking forward to sharing many more Vital Proteins things with you throughout the rest of 2018, including recipes and ways to use their products. If there is something in particular you’d like to know or recipe you’d like to see using the product(s), please EMAIL ME. Disclosure: This post is a paid partnership with Vital Proteins. All opinions stated here are 100% my own. I appreciate your support, as this compensation helps with expenses to keep this blog up and running, and for me to continue sharing all that I can with you. For my full disclaimer and disclosure click HERE. Thank you for your support! I also do believe in gelatin and I will try Vital protein beef gelatin. How do you eat it? Do you add something like fruit juice ? I am fructose intolerance and I am wondering what I can add to the gelatin to make it more tasty. Can you reccomend something? I have not tried the gelatin, only the regular collagen, but after reading this I definitely need to. I am trying to heal from issues with GERD and working in more broth is on the top of my list. Thank you for this great information! Most welcome. You will love this for healing! No, I have not tried the gelatin. I have never tried the gelatin, however you’ve definitely convinced me to give it a try!!! I have used this product and have loved it! 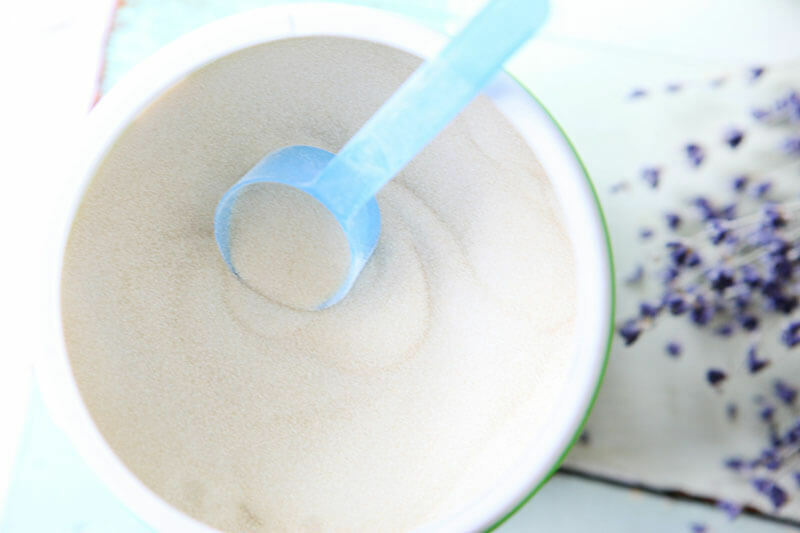 I noticed such a change in my skin – it was firm, glowing, and hydrated! My nails also got stronger too! I usually mix it in with my coffee so I know I’m going to get this great product in my system everyday. A gem of a product! What a lovely testimony for the product. Thank you for sharing, McKinnley! I have not tried it, but after reading this post I am definitely going to! For low stomach acid, general soothing/healing and healthy body weight. Also want to try the AIP Bread (even though the sugar in the bananas/plantains scares me, having SIBO and candida). My AIP Bread is soooooo good. In fact, I need to make a batch ASAP. No I have not tried the Gelatin or the collagen, but after reading your posts I really think I need to! Your posts have really encouraged me to really try to improve my gut health as it has been horrible for years and I just want to finally be comfortable! Love this, Kim. Nothing changes if nothing changes…. I haven’t tried the gelatin but you have inspired me to try it. Thanks for hour help. I have never heard of the importance of gelatin and am so thankful for your wisdom and expertise! Im off to buy the ingredients to make my very first bone broth! Something I’ve read about but never stepped out and tried! Next will be to order some of the Vital Proteins gelatin! Yay! I think you’re going to love it. Keep me posted. 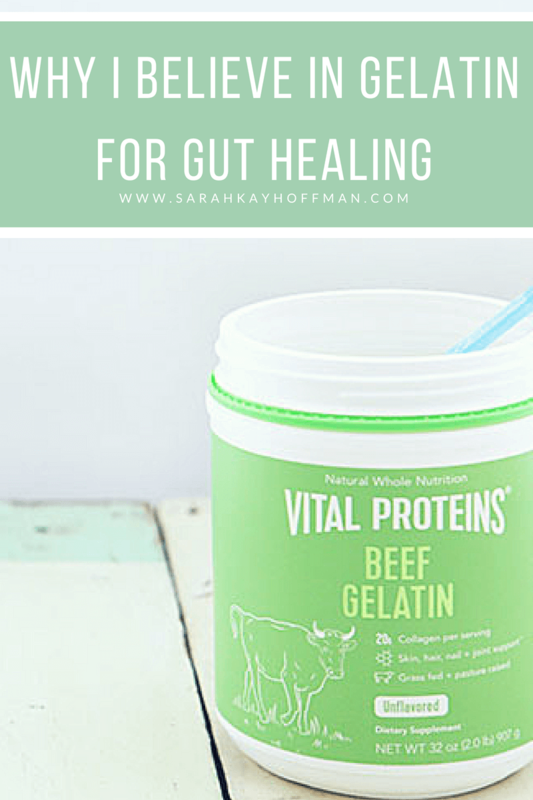 I have not tried gelatin before but i love vital proteins! I have not tried the gelatin, but am up to try it. I had a stomach ulcer a few months ago and that messed up my gut so i’m In the process of healing. These are great tips and you provided great info! You will get better, Karen. Believe it! I use collagen every morning in my ginger tea for healing my gut and joints. Love the travel packs which are so convenient!! Agreed! I carry things like this with me constantly. I have only tried the coconut creamer in coffee and it was amazing! I would love to try vital proteins products in all the ways you’ve listed. You havr great recipes and easy guide to add them in. Thanks! Loving all this info!! You are most welcome, Cassie! I use Vital Proteins collagen peptides in my coffee every day. I originally bought it for my hair, skin and nails and now I’m hoping it it’ll help with my gut health! So many great benefits when using it. 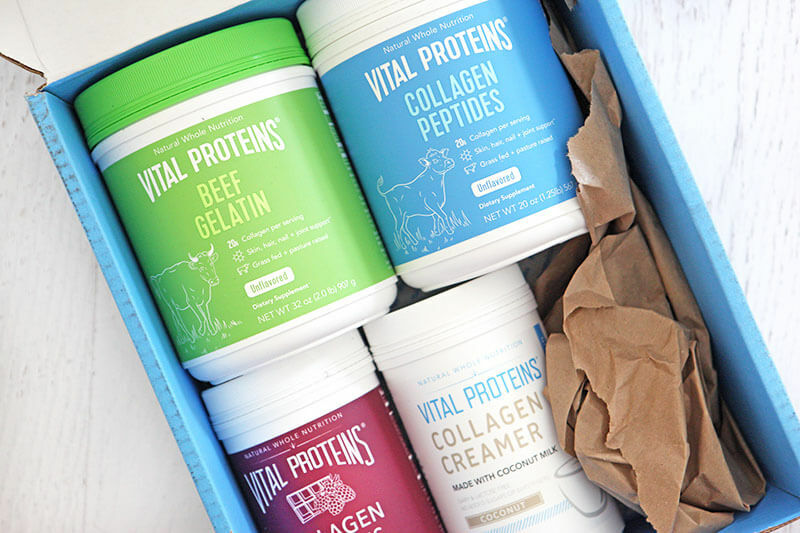 I’ve used their collagen and other brands of gelatin but love Vital Protein’s quality. I recently used gelatin in a low carb brownie recipe I found…. trying to heal/eradicate SIBO so I can move forward with fertility treatment with my functional medicine dr.
That sounds so good, Erica! This article makes me want to try their gelatin for sure!! I have heard great things about gelatin, but I have yet to try it. Your post makes me want to give it a try it! I love Vital’s products so much! Their collagen and matcha are my favorite! !